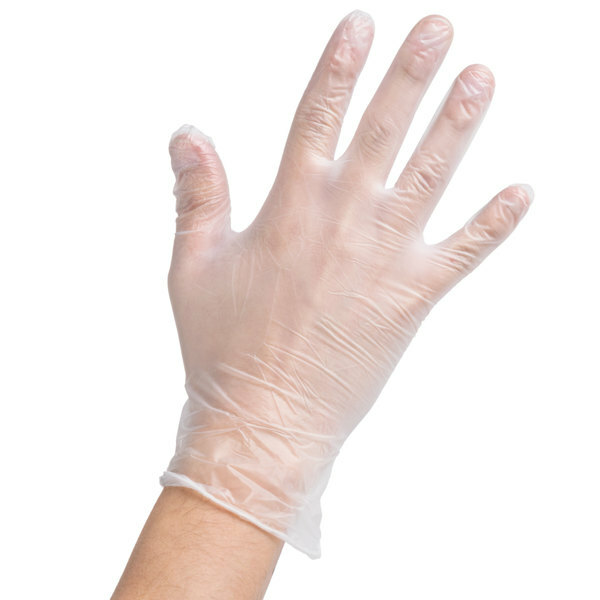 Maintain a safe and sanitary work environment with these Noble Products large powder-free disposable vinyl gloves! "We love these powder free vinyl gloves for every job. We use them for food preparation as well as presentations to the public. They fit well and hold up." These gloves fit me perfect. And they don’t tear easily. However when your hands are wet or just a tiny bit damp, they are hard to put on. You can never have to many gloves and these gloves are mess free and light weight. I make everything homemade and sometimes i don't like my hands getting to messy so these guys are perfect! These gloves are the perfect size for the average size person who works in the food industry. When you need a more adult size glove this will do the trick. These are great gloves at a great price. Better than the gloves I can get locally, that always would break around the cuff. These fit snug but not too tight, and watch the sizing. I usually am a medium in medical gloves but the large are comfortable. Fits size to size! Great price compared to the large chain stores. Sanitary! Must have for any type of restaurant , cafe or industrial cooking facility. My employees loved that glove! It fits perfect, so you feel as you are not wearing gloves. It is perfect to bake and make chocolates. Fits true to size and no where near the sweat some other brands bring. I love how comfortable they are to wear while cooking and cleaning. Good price and a good fitting glove. I have rather large hands and these work well for me. I do not like the loose gloves that will not stay on while working. 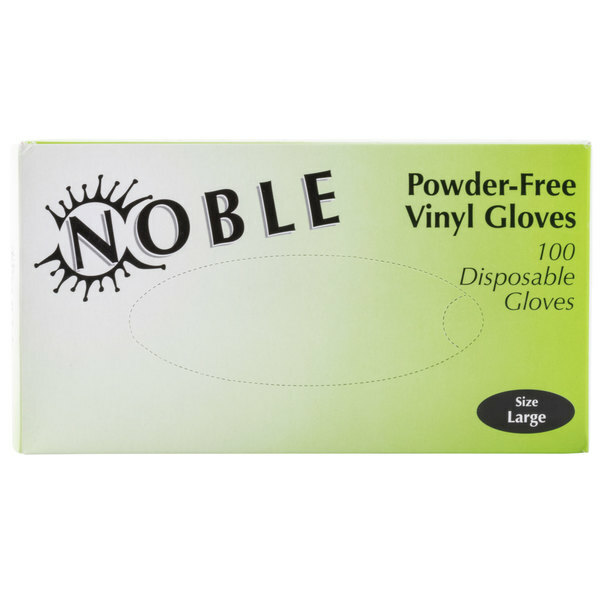 Noble large powder free vinyl gloves are the best gloves to buy for food service! They are made with great quality and are easy to put on and remove without tearing easily. Great gloves at a great price. You can't go wrong with the Noble Vinyl gloves. 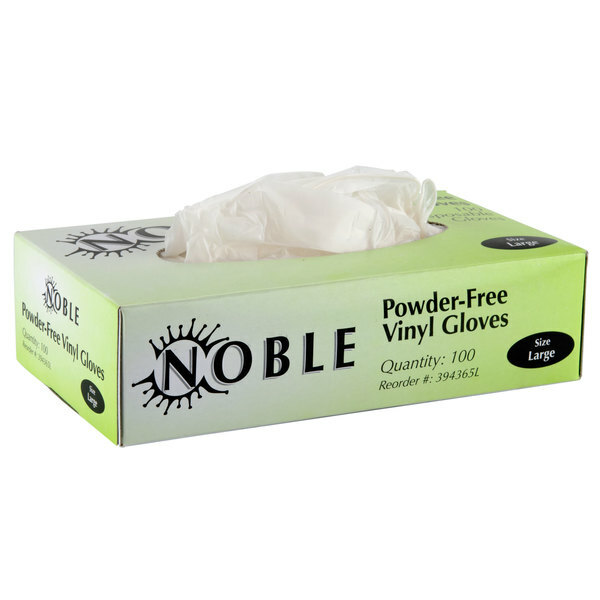 Power and powder free are a great bargain and don't tear too easily..
We use these gloves in our store daily and they are a great quality. I shopped around for prices and as always Webstaurantstore.com has the lowest price for them. It's so reliable. The fit is great and not very snug that it cuts off circulation like other brands. The best part is that it's translucent, and will last the whole 2 hours of the shift we spend at the food service line. This is a high quality product with great durability. They are stretchy and do not tear easy when trying to put them on your hands. I use these when I have to prepare a lot of meat. Its thick without restricting the fingers. I have not had one rip on me yet.